Fiona Beddow is an author who writes fast-paced, heart-tugging adventure novels for girls. She is a member of the Girl Effect Movement and is passionate about championing the rights and aspirations of girls. We are very pleased that she is also a big supporter of Khushi Feet. Fiona recently interviewed Khushi Feet’s founder, Emily Cook. You can read the interview here. Fiona’s exciting new novel ‘Fierce Resistance’is out now on Amazon and we highly reccommend it! Thirteen-year-old Beth Hardy wouldn’t swap her little brother Peter for anyone. So when Britain is brutally invaded by the Malvanian army and Peter goes missing, Beth is desperate to bring him back home. Risking capture, brainwashing and imprisonment, she plans a daring rescue. Then a dramatic encounter with a secret underground cell transforms her from teenager to tough resistance fighter – and from devoted sister to ruthless rescuer. Resistance member Ricky captures her heart – and she learns that not all love can survive in war. As the enemy closes in, she must continue her quest, using her skills as a brave rebel and cunning saboteur to bring her brother safely home. Breathlessly fast, and always pulling at your heartstrings, this book will remind you that you can achieve whatever you want … if you really want it. 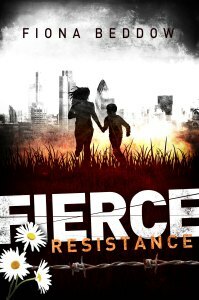 Khushi Feet, in association with Fiona Beddow Books, are running an exciting COMPETITION, giving you the chance to win a signed copy of Fierce Resistance and some Khushi goodies. On top of this, the name of the winner will be used as a character in Fiona’s third book! Email your answer, your name and age to khushifeetcomp@yahoo.co.uk. Closing date: Sunday 31st August 2014. Correct entries will be drawn out of a hat. We have an even bigger and better competition planned for later this year, so watch this space!